Francesco Firano, the owner of Italian cryptocurrency exchange BitGrail, has been ordered to return as much of the assets to his customers as possible by the Italian Bankruptcy Court. The judgment was published by the Bit Grail Victims Group (BGVG) on Medium on Jan. 28. The crypto exchange had lost 17 million NANO (approximately $ 170 million). The court-appointed technical authority concluded that Mr. Firano (“The Bomber” as Mr. Firano called himself on social media) was guilty of the loss and is ordered to pay as much of the assets to his clients as possible. The judgment is a milestone verdict that establishes a great example of the stability of cryptocurrency users globally. In its judgment, the court decided that both Bitgrail and Mr. Firano, individually, be listed bankrupt, approving apprehendings of many of Mr. Firano’s individual assets. So far, officials have secured more than $1 million in personal assets. Millions of dollars in cryptocurrency assets have been squeezed from Bitgrail’s exchange accounts and transferred to accounts controlled by administrators elected by the Court. In its ruling, made known on January 21, 2019, the Court observed that the NANO described lost by Mr. Firano on February 9, 2018, had really been excluded from the exchange months preceding, between July 2017 and December 2017. The Court reprimanded Mr. Firano for not instantly taking actions to estimate for the losses. By anticipating to execute the shortfall public, Mr. Firano caused the people to sustain considerably higher damages. In July 2017, 2.5 million NANO was estimated at around $250,000 (1/100th of the value it had in February 2018 when Mr. Firano went public). The Court also decided that the exchange had failed to fulfill any significant defenses to guarantee the “idempotency” of NANO retreats from the Bitgrail exchange. An idempotent operation is an action that may only be accomplished once and if implemented again will generate the corresponding result. The Court observed that in July 2017, 2.5 million NANO were missed by the exchange. The Court remarked that Mr. Firano had been knowledgeable of these illegal withdrawals almost instantly after they transpired and discovered that Mr. Firano had announced on Twitter in late July 2017 that he had denounced accounts attached to the illegal transfers. After three months, in October 2017, extra 7.5 million NANO had been inappropriately excluded from the exchange and again Firano took no significant action. After that, in December 2017, Mr. Firano changed his exchange’s primary wallet into a cold wallet and started intermittently stopping the exchange to the people. In January 2018, Mr. Firano shifted possession of Bitgrail from an individual proprietorship, Webcoin Solutions, to Bitgrail S.r.l., a limited accountability company. The Court also unveiled that the Italian Criminal Prosecutors, who have been examining Mr. Firano in kinship with his service of Bitgrail, stated to the Bankruptcy Court that between February 2nd and February 5th, 2018 — days before Firano would present his public statement about the 17 million NANO loss — Mr. Firano had saved a total of 230 Bitcoin (approximately $ 1.8 million) in an individual account on a BTC-EUR cryptocurrency exchange called The Rock Trading. Firano had also tried to obtain retreats from ATM machines connected to his Rock Trading account. On the other hand, Firano claimed that his exchange was just a provider of services and that the currencies saved on the exchange were “regular” since he could not unobstructedly utilize the saved currencies. On April 26, 2018, bankruptcy requests were registered on behalf of the victims. After that, the Public Prosecutor’s Office of the Court of Florence meddled in the processes, requesting the Court to state both Bitgrail and Mr. Firano bankrupt. 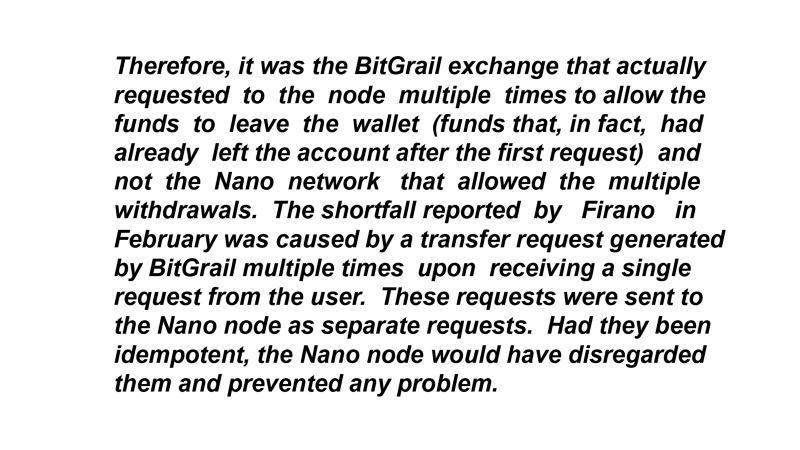 They claimed that it did not suggest whether the cryptocurrency deposits on the Bitgrail exchange were held “regular” or “irregular”, either way, Mr. Firano had a fiduciary responsibility to serve as the caretaker of the funds. The Court declared that even if the deposits were held “regular,” Mr. Firano was accountable for the losses endured by the victims because the losses started from Firano’s behavior and as a guardian, Firano also neglected to quickly report to the investors the incident that he had lost some of the assets.